My family is going crazy with the basketball brackets this month, especially since all three Iowa schools were in the tournament! Go Iowa! It seems like each meal is ‘game day food’ because the TV is always on with the latest round. When my cooler arrived of True Story organic meats, I thought perfect! The game food is here and the Chunky Greek Salsa will be made. 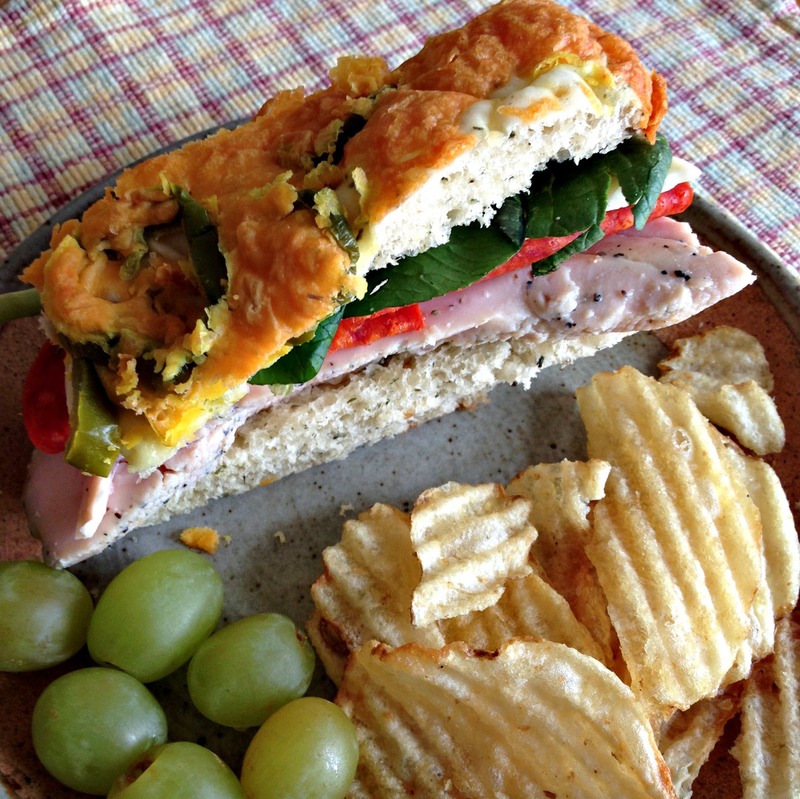 The first thing I put together was sandwiches using the deli slices on Jalapeno Cheddar Bread from Sprouts bakery. Sprouts Farmers Market is a new store to me in Colorado. When I went shopping this week I took the time to really look around and thought wow this grocery is really great! The produce was amazing and affordable and picked up all my ingredients of my dip which I’ll chat about here in a minute. Avocados, Apples, Peppers, oh my! We headed over to my brother’s new house this weekend to grill out and watch the games. He is very picky about what goes in his mouth and was excited to be introduced to True Story organic meats. He was our grill master for the evening and I think he did a great job! 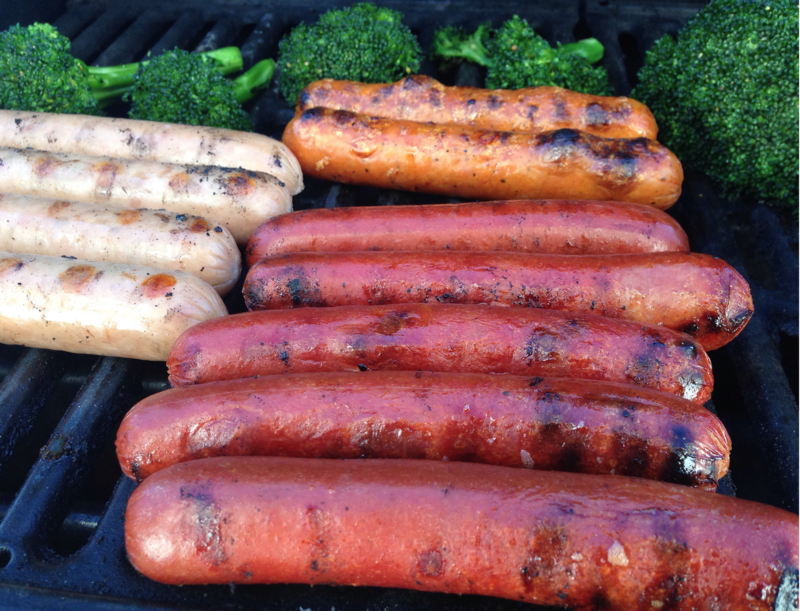 Just take a look at these dogs and sausages. Our mouth was watering. While he was busy grilling it up, Hubby was in the kitchen making his famous Chunky Greek Salsa. It is the perfect dip to eat with chips AND to top on your chicken and hot dogs. Win win! Chop up and Mix. Serve right away. We were all laughing over dinner that this dip is really not very photo friendly! ha! I hope that doesn’t deter you from giving it a try because it is SO good! And healthy. And a side you will want over and over again with different courses. I have to admit that I was a little afraid of the Sriracha Jalapeno Chicken Sausage because it sounded tooooo spicy, but you know what? It was my fav! The flavor was perfect. The organic meats were ALL great I should say! Brother roasted AND grilled up some extra veggies to eat with our meal too. Afterwards I whipped up a batch of brownies. It was a great evening for grilling and I know there will be more to come as we test out all that True Story organic meats has to offer as the weather gets warmer. Love being outdoors! 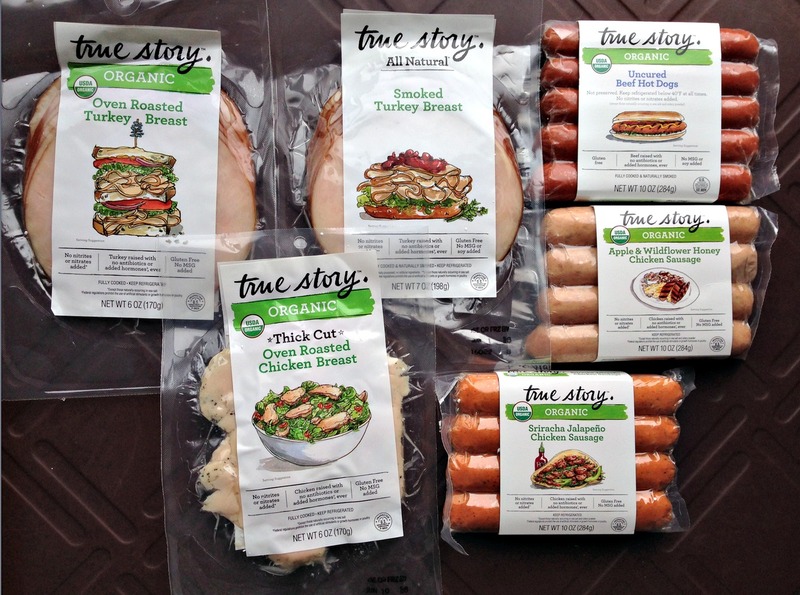 Have you tried True Story Foods? 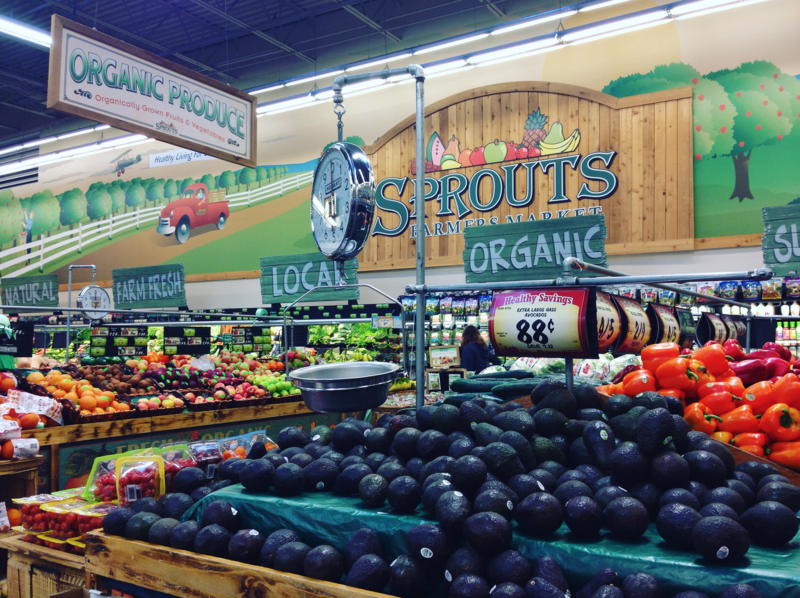 Do you visit Sprouts? WIN $25 to Sprouts Farmers Market to give True Story a try! I received these items for my post to share with you from True Story and Sprouts. All opinions are my own. We always love serving fresh fruit and veggies, you are what you eat! thanks for a chance! We don't really have any special "Game Day" foods. I love Sprouts and will be checking out their True Story organic meats!!! Thanks for all the info, and for sharing your Chunky Greek Salsa recipe...sounds yummy!! We love to make cheese dip! I do not prepare anything special, I do not watch TV, but my husband does. So it is like any other day. I dont have any game day food but we do have family parties and we love to bbq and its always fun. I really love deviled eggs and potato salad so that would be on the menu for sure. Also a yummy taco salad really hits the spot too, thanks! I don't follow games, but would love to try these organic meats!! i love love love sprouts! i got so excited when a new one opened up another town away from me. scared the poo out of my hubby with my excitement as we passed by it ! lol they have the best produce ! I love organic pkg. meat like this. I've never seen this brand, but will be purchasing when I do. Add some good cheese, some lettuce, tomatoes, cucumbers, and some good cookies or cupcakes. That's all you need! We love having wings, sausage sandwiches, and a vegetable tray. I love to make a buffalo chicken dip for my family. I make carrot cake on game days. Not sure how that started! I make pigs in a blanket. We all LOVE them ! I love Sprouts, yum! Your dish looks amazing! We love nachos on game day! We like to make a nacho cheese dip. No, I never watch any games. We don't watch any games for a "game day fave" but we do love making finger foods for Sunday afternoon lunches! organic spinach artichoke dip with home made chips. I like to make some good hummus with pita chips. 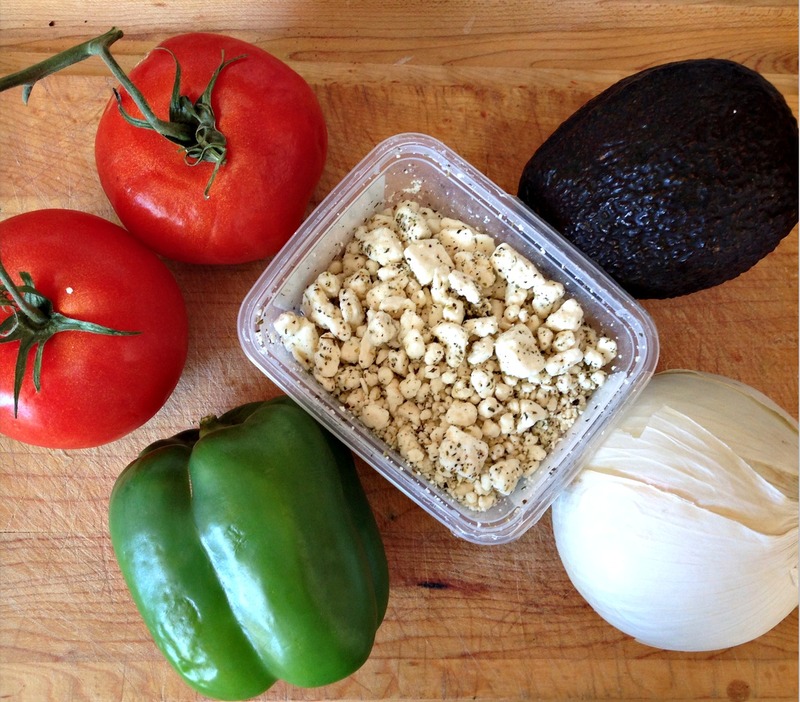 Our favorite is pico de gallo guac, but now I will have to try the recipe you posted!! I do not have a game day food I like to prepare. Not really. A lot of times we will do crackers and cheese slices or chips and dip for a snack. I like to make ribs. We love pizza for game day. We love to make guacamole. We like chicken wings on game day. I love to prepare chicken wings! i do not have specific foods for game day, but burgers could be added. 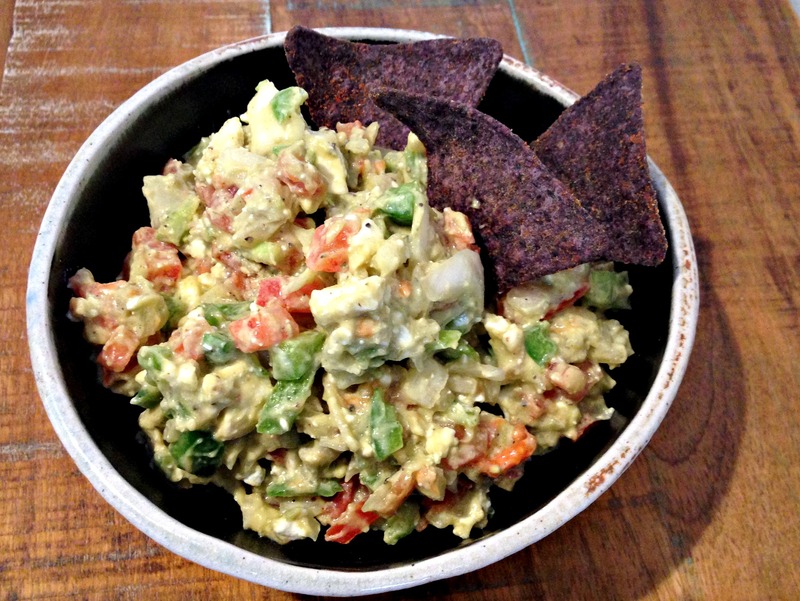 Hubby has his cream cheese, salsa and avocado dip that he makes! This salsa looks good but I think I'd use a Mexican cheese (Fresco cheese - it's crumbly) in it instead. I love preparing spinach artichoke dip. Our favorite is homemade guacamole. Favorite game day food is definitely sliders! We love veggies and dips, sliders and chips. I make stuffed mushrooms and spinach artichoke dip as my standards. My family loves nachos on game day. Turkey Chilli is my favorite game day food. I love wings or stuff jalapeños. We like to make hamburgers and hot dogs on game day. Also, we always have a veggie plate with Ranch Dressing. I like to make Italian Heros with chips on game day. Another great game day food is Chicken Wings and Celery with Ranch Dressing. Another favorite my family loves on Game Day is Chips with Homemade Salsa. simple easy fruits & vegetable to pick at w/various dips. Also small build your own beef/chicken sliders . Wings of assorted flavors pickup celery & blue cheese from the vegetable station. 3 or 4 different jellos made for team colors. On game day we always make some type of dip. We try to change it up everytime. For some reason, my family likes homemade Italian foods on games day. It is sort of a family tradition in our home. There is usually meat lasagna or meatballs and pasta. And there has to be garlic bread or else! I like to make spinach and artichoke dip. We're big fans of nacho bars! I love to make pigs in a blanket for game day. It's a big hit, especially with the young kids. We always have salami, cream cheese & pepperoncini roll ups. Simple but soooo good! My new food is hummus. Why have I never made it before I have no clue but it is my new go to make party food. i love to prepare white sausage chili! thanks so much for the chances to win. 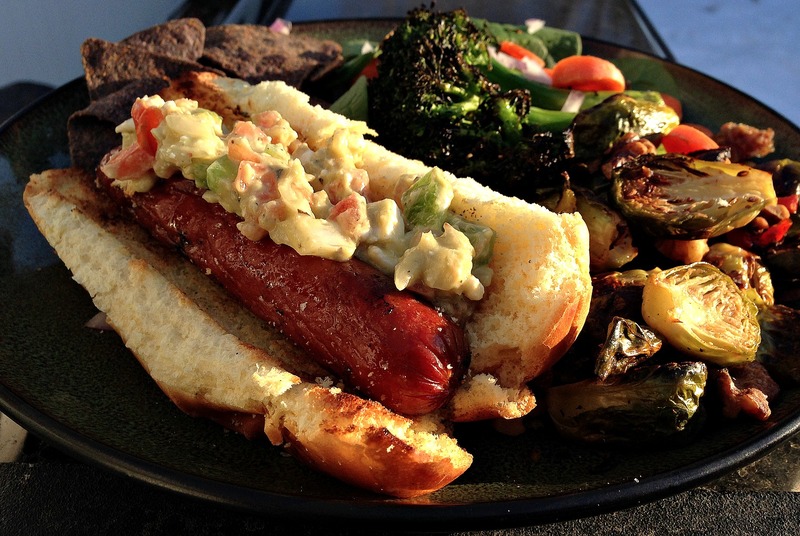 Organic Apple & Wildflower Honey Chicken Sausage Thanks for the contest. My husband is always asking for burgers on game day. BBQ, of course! Here in KC that's king!! Hot cheese dip with chips! game day food is all about wings BBQ'd of course and slathered in spicy sauce. I think chili is fun to serve on game day! I love to make buffalo chicken dip. I love making guacamole and mango salsa to go with a barbecue. We like to grill beef & veggies for fajitas on game day! I like to prepare frankfurters. We do burgers and bratwurst. Just whatever is convenient to fix. I like to make chicken wings.